A relaxing therapeutic treatment that has been practiced in India for thousands of years. This gentle but firm massage is from a Hindu Ayurvedic practice that focuses on your neck, upper back, scalp and face. You remain clothed and are comfortably seated in a chair. Sessions are usually 20 to 30 minutes. It is quite popular to combine this with 30 minutes of reflexology for a total 60 minute treatment. Quantum-Touch is a remarkably effective method of generating powerful healing energy. Combining intention, running energy and matching the breath, there are many profound physical and emotional healings achieved. This therapy is a non invasive hands on energy modality to adjust alignment, shift bone structures, relieve pain etc. It can benefit the whole body. From ancient methods and some contemporary neuroscience research came this process to change subconscious beliefs where at least 95% of our consciousness operates. It is a process that transcends the standard methods of visualization, affirmations, will power, and positive thinking and it is especially effective in the areas of behavioral/habit change, wellness and stress reduction. It is a non-invasive interactive process of change with a proven record of success for over 25 years! A ZYTO bio-communication scan is a computer program. It is a simple and painless process that can take as little as three minutes. 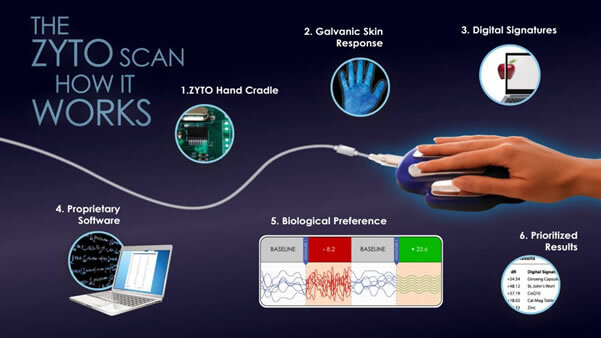 You place your hand on the ZYTO hand cradle, with your fingers resting on metal strips and a scan is run. During the scan, subtle energetic impulses are introduced to your body. Your body will naturally respond to this communication and the ZYTO software records each response. Although a few people may be able to sense this energetic communication, most are unaware that the scan is taking place. It measures fluctuations in the energy patterns of the skin, the energetic field which processes 400 million impulses of information per second. The responses indicate biological preferences for nutritional supplements and foods to avoid. * Zyto Compass does not treat, cure or diagnose. There are over 200 known reflex areas on the skin which represent various organs, glands, and nutrition points. ERT (an advanced form of muscle testing) uses these known reflexes to determine if there is an interruption of nerve energy to these reflexes. A lack of nerve energy is believed to be the cause of any health condition or symptom. ERT is the process where you point to or touch one of these reflex areas while the individual you are testing has their arm extended to make a 90 degree angle to the body. or toxicity, when you press on the arm the muscle will lose its strength and go down. If the reflex has electricity or energy moving through it when you press on the arm the muscle will stay strong and will not go down. This is a phenomenal process as the person pressing on the arm is applying the same pressure in each case.